(Nanowerk News) A simple pair of contact lenses may soon alleviate the need for diabetics to regularly draw blood in order to test their glucose levels. The work of Chemical & Biochemical assistant professor Jin Zhang, and the use of extremely small nanoparticles in contact lenses, may soon change the way diabetics monitor their glucose levels. These engineered nanoparticles react with glucose molecules found in tears - similar to those found in blood - causing a chemical reaction. When there is a variation in a person’s sugar level, the contact lenses respond by changing their color. Zhang is cross-appointed with London’s Ivey Eye Institute, affiliated with the University of Western Ontario, and is working with clinical doctors on her research. She recently received $216,342 from the Canada Foundation for Innovation (CFI) to further develop her research. But while she is excited about the progress of her research and the attention it is receiving, Zhang is well aware there is still plenty of work to be done. The project has been ongoing for more than two years, working with her multifunctional nanocomposites group in Engineering. Also, the nanoparticles are only able to detect specific changes in glucose levels and Zhang would like to see her research allow for the detection of even more subtle changes. Zhang is also researching ways to make the sensors be able to detect other components in tears, such as calcium, which could be used to test for osteoporosis. “The goal is to make this simple and safe,” says Zhang, “We are getting closer and closer and with the CFI support, it will definitely speed up the research. 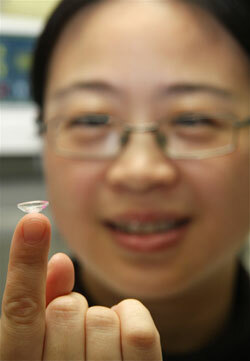 We have a great environment here at Western to make this project move forward.” Through the use of nanotechnology, University of Western Ontario Chemical and Biochemical Assistant professor Jin Zhang is using extremely small particles embedded in the hydrogel contact lenses to monitor and report on changing sugar levels in the body.